Our patented Controlled Atmosphere Chamber Systems deliver very reliable modular storage solutions that protect perishable goods. Products to be stored can be palletized, cooled (or conditioned), and then sealed within the Chambers, which are made of durable metal panels and specialized sealing material. Each sealed Chamber is checked to ensure a moisture barrier and gas-tight enclosure has been obtained, and an initial atmosphere is then established. The Fresh ProTech® controller uses sensors to monitor gas levels and smart software to manage the atmosphere in each Chamber directly or in groups of Chambers via a network of plumbing. 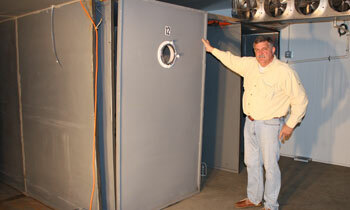 The Chamber storage system is suitable for medium to long-term storage under CA conditions. This unique system provides the ability to set individual gas atmospheres and sanitizer treatments within each Chamber making it well suited to use for high value fruit, vegetables, and other perishables. The ability to quickly and easily remove a small number of pallets from the CA Chamber for distribution means that one or more pallets can be taken out of the Chamber without affecting the atmosphere storage of the rest of the pallets. This flexibility offers optimum market pricing while ensuring quality control of products throughout the storage period. 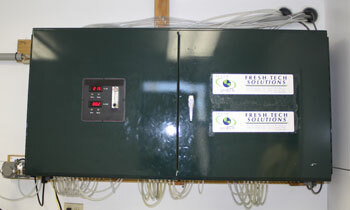 The CA Chamber system is designed to work within existing cold rooms for storing temperature sensitive produce, and uses sensor probes to monitor the temperature in the cold room itself. The Fresh ProTech® controller continually measures and manages both the CA conditions and any sanitizer treatments in the storage Chambers. The controller also provides programmable alarms to alert operators if conditions do not meet set parameters. Switching to different gas levels for different produce or adding the Fresh ProTech® Plus sanitizer treatment is as easy as typing. Our Fresh ProTech® smart software along with the ability to remotely monitor and manage the system via direct link or the internet makes the Fresh ProTech® CA Chamber system a clear choice for customers needing a very accurate yet flexible CA storage solution. The Chambers are built of epoxy painted steel panels for reliability and years of cost efficient operation. The modular design allows for maximum flexibility, as panels can be added to expand the number of pallets held from one to a few hundred. Our systems are designed to operate in cold room or industrial environments and built-in back-up components helps assure that they are ready to run when needed. System options include custom equipment for generating Nitrogen and/or ozone onsite to ensure all sanitizer treatments are safe and effective. Fresh Tech provides custom built CA Chamber systems and everything needed to deliver the best CA available for perishable products. We have it all, FDA/USDA approved gas or on-site generators, complete "plumbing" from the controller to the Chambers (including quick closure gas-tight doors with windows), specialty alarms, and safety features for protecting people, products, and the system. The service starts with our experienced personnel understanding the CA needs and objectives of each customer, we then customize our CA Chamber system to best meet those needs. 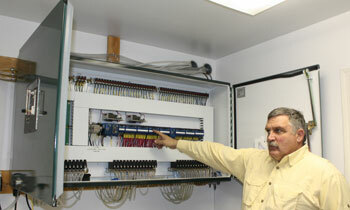 The custom system is then designed, built, delivered, and installed by our technical team. After the installation is complete and the equipment is operational, a technician from the team provides on site training for the customer/operator. To support the CA Chamber systems, there are additional customer care programs that can be purchased by customers with a current use license. These support programs start with the Fresh ProTech®; call-in and remote monitoring service. FTS technicians' are also available for regular onsite visits, real-time online monitoring, operational repairs, and routine maintenance to adjust the equipment for optimum results. These additional services are all designed to help assure your system is operational and ready to run when needed. All Chamber systems regardless of their size and the level of automation include email and phone access to our technical experts. We are dedicated to providing the best CA systems and the service to match.